The Galaxy for Proteomics project (Galaxy-P) began as a collaborative project between the laboratory of Tim Griffin at the University of Minnesota, and the Minnesota Supercomputing Institute. The Galaxy bioinformatics workbench was developed over a decade ago to solve problems in genomic informatics. Galaxy provides a user-friendly, web-based, scalable platform where disparate software tools can be integrated into useful workflows. Complete workflows and completed analyses can be shared with other users, and the greater Galaxy-user community, promoting reproducibility and transparency in the analysis of “big data”. 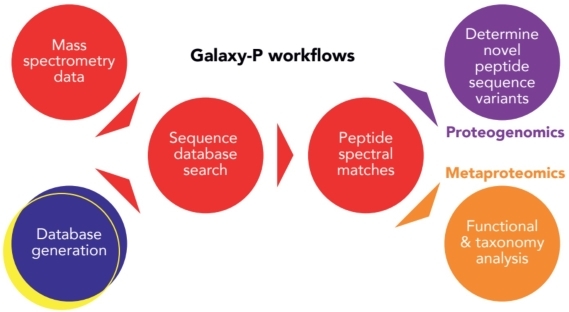 The initial phase of the Galaxy-P project was funded by a U.S. National Science Foundation grant, with goal to deploy popular software for mass spectrometry-based proteomics data analysis within the Galaxy platform, and promote its use by the greater research community. Since then, the project has expanded into emerging application areas integrating software across ‘omic domains (multi-omics), for applications in areas such as proteogenomics, metaproteomics and metabolomics. This ongoing phase of the project is highly interdisciplinary and collaborative, involving software developers, data scientists and wet-bench biological researchers. Financial support comes from the National Science Foundation and the National Cancer Institute’s Informatics Technology for Cancer Research program. A web-based bioinformatics data analysis platform. Software accessibility and usability, share-ability, reproducibility and ability to test and compare results after using multiple parameters. Multiomics informatics platform for integrative analysis of proteogenomics, metaproteomics and metabolomics data. Integrated Multi-Visualization Platform plugin for data analysis within Galaxy-P. The Galaxy-P team is always looking for new and exciting collaborations.